I like to capture a colorful life but, I have to admit, I don't always live a colorful life on a day to day basis. How so? Well, my closet is mostly filled with black, gray, and lighter gray. I stare at textbooks with barely any use of color most of the day. And I sit at a desk or in front of a computer, soaking up as much color as I can to compensate for everything else. If this sounds like you too, I'm glad I'm not the only one. But maybe there's hope for us, right? There's gotta be. 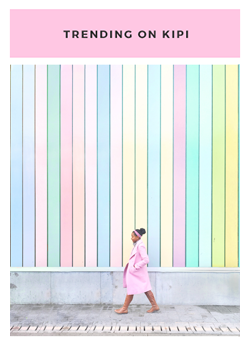 I've jotted down some quick and easy ways we can both start to put some intentional color into our every day. 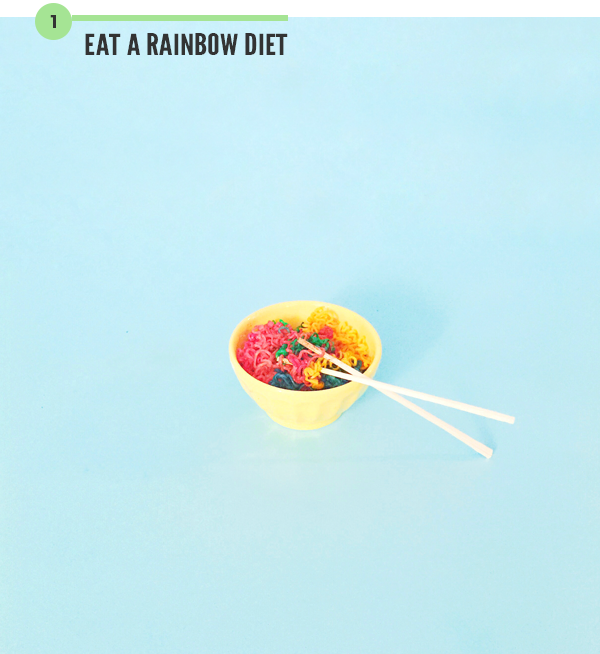 Eat a Rainbow Diet: No, not a ramen diet. A diet that is filled with color naturally. Strawberries, carrots, bananas, broccoli, blueberries, and grapes -- that's (literally) a rainbow of color. Try to see if you can intentionally eat a rainbow of fruits and vegetables as you snack throughout the day. Color challenge, accepted! Or, for a quick cheat, pile it all into a blender and enter smoothie heaven. 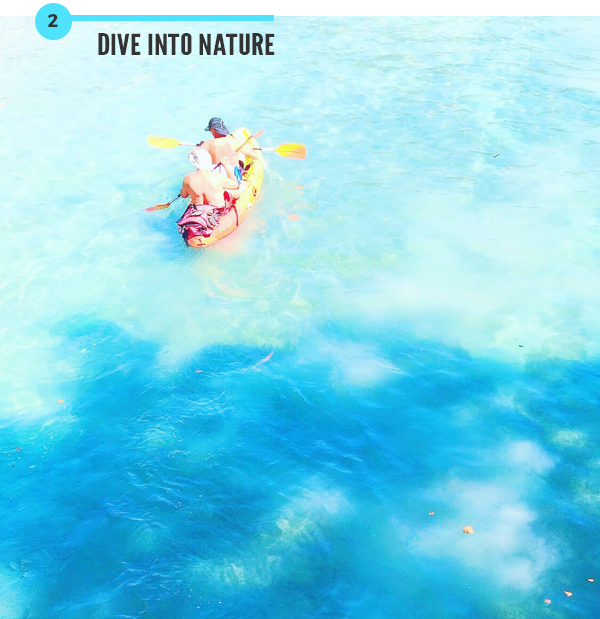 Dive into Nature: You don't have to do exercise, don't worry. But it certainly wouldn't hurt! Take a few minutes to an hour each day to immerse yourself in nature. Drive by the beach, have lunch under a shaded tree, take a walk into your local park, go for a swim, or simply sit outside with your eyes closed and feel the sunshine on your face. 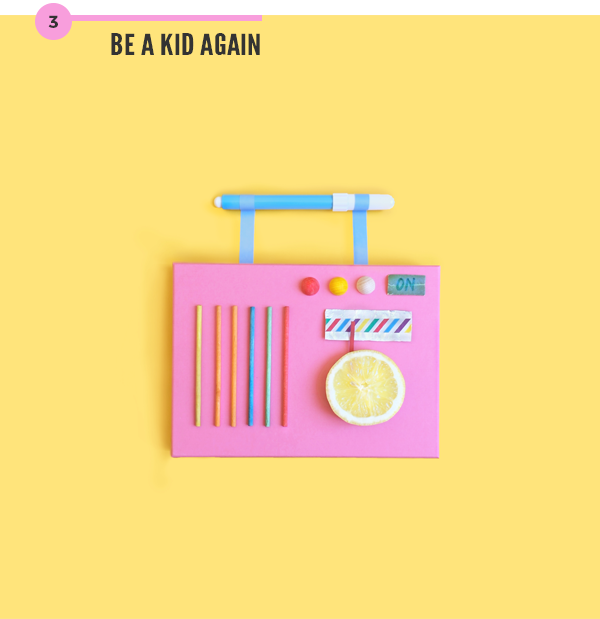 Be a kid again: Trust me, it's the best thing in the world. Pull out those crayons, markers, glue sticks, and paint -- it's arts and crafts time! There are plenty of socially accepted adult crafts you can do. Find some inspiration to upgrade your life here in the DIY section on my blog, like this easy way to make woven wall art. 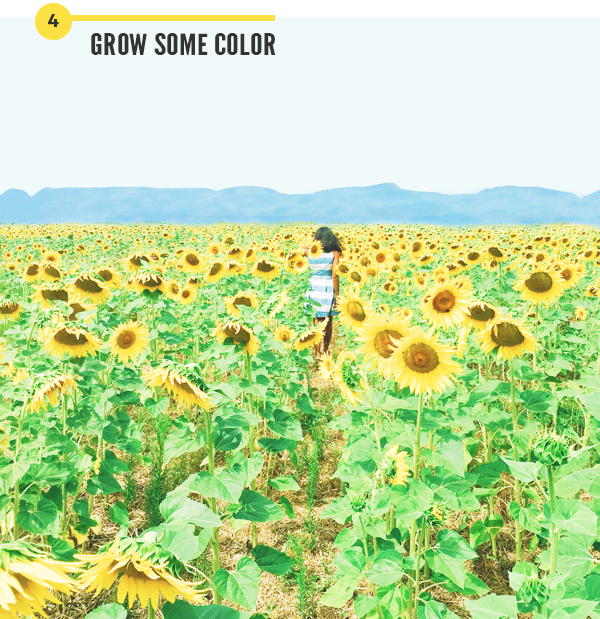 Grow some color: I'll admit, this one I would absolutely love to do but it's a hard one. Growing a garden, even a small one, takes steady time, dedication, learning, and patience. Ain't nobody got time for that! Okay, that's not true. I'm sure a little each day is a great way to push yourself outdoors, immerse yourself in nature, and create a rainbow of flowers, fruits, or vegetables. It pretty much accomplishes all the three previous suggestions I made above. But, if you're like me, and as much as you'd love to garden, you'd rather take the time to Netflix binge. So for all the garden idealists but not realists, start small. Buy one plant. Place it near a windowsill, take two minutes each day to add some water or check it out. If that goes well, add another one. If it doesn't, there's always plastic flowers and plants for us, and you can even make fun home decor like my 3D floral wall. Color your closet: This one is my favorite. 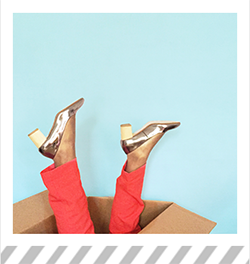 Who doesn't love a new excuse to buy a pair of shoes?! In reality, there's a lot of affordable (and not so affordable) ways to add some pops of color to your wardrobe. It's up to you. And if you think you only look good in black, or a gray sweater will match better than a yellow one, all you have to do is just try one colorful piece. 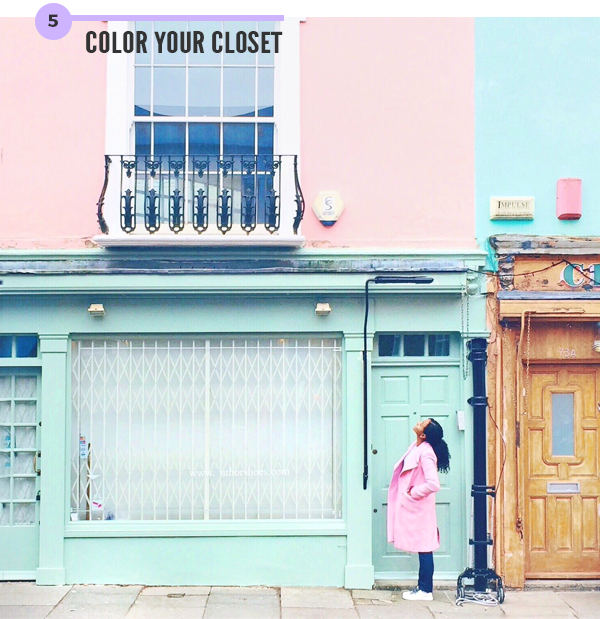 Borrow from a friend, go to a secondhand shop, or check out some of my favorite stores below for finding trendy, chic, and subtle ways to add some much needed hues to your closet. You'll be surprised to notice how much happier your day is. If big clothing items, like sweater or pants, are too much of a leap for you, try adding color with smaller items like your accessories and shoes. I've got some fun DIY ideas for those as well, like these popular yarn bracelet sandals. So, what do you think? Anything sound doable? Share with a friend you think could use some helpful color tips by clicking "Gotta Share This" below! This post is so inspiring! I definitely need to add more color to my diet. This post just confirmed it for me lol. 😊 Also, the graphics in this are great. I love the topic you choose for write a wonderful blog. 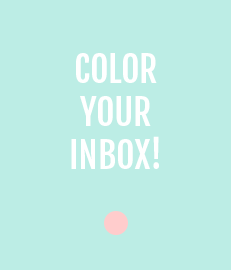 It’s such an amazing ways for how to live more colorfully. And I really need to add more color in my diet and this post conformed it for me via provide a rainbow of color as well as I also want to apply all the thing in my life for refreshing because I am by profession educational consultant and economics assignment help provider to Australian students who struggling with Economics courses enhance their assessments and achieve a more elevated amount of scholarly execution & come to seeking help from Secure Assignment Help. I am also suggest this wonderful colors to my students & see what they feel about it. Today I come to know very important topic that how to capture a colorful life. It is really very different kind of post which attracts readers to read as it is easy to pick up as well as its really best guidance for all the people who need break and refreshment in their boring life. I have to share information about this colorful live with my students who have been taking assignments writing services Melbourne from me at Assignment Help Folks as I am working as assignment writer and those students are also interested to read such kind of blogs, so it may give them idea about such how to live colorful life. 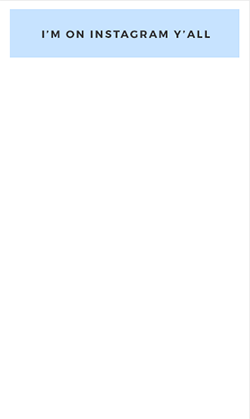 Wow…what a beautiful blog. It is my pleasure that I am here and reading your blog. It’s really refreshing article which provide us a positive energy. By profession I am an educational consultant. So I am whole day busy at UK’s well-known educational services provider consultancy Personal Statement Folks where our team creates eye-catching marketing personal statement - http://www.personalstatementfolks.co.uk/marketing-personal-statement/ for UK students with clear English which focuses on highlighting the key points which the admissions tutor look for. So I need break from my daily routine and I found your amazing blog. And after reading it I am actually feel very stress less. 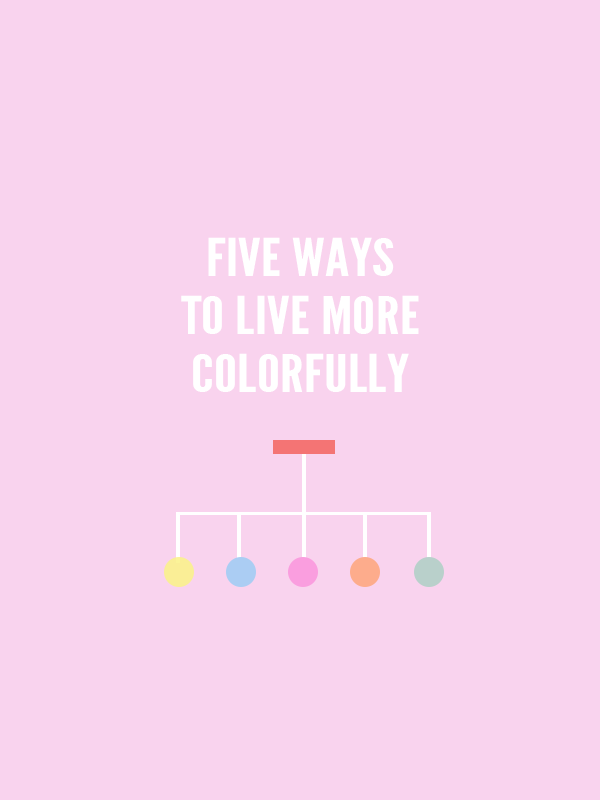 Thanks for sharing such a wonderful five ways to live more colorfully. Haha, I can easily improve in that department too, despite what my wallet says otherwise! :D Thanks a bunch for stopping by, Annika! Stumbled upon you via Instagram and I love your colorful site and pics!! When I read that someone else loved color but also had a closet of mainly blacks, greys and more greys I was like / ahhh!! This Marjorie is my people!